Shake Your Hair Protein Shake. 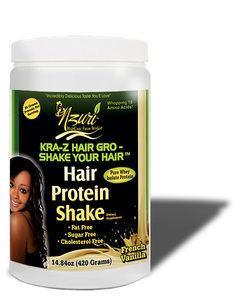 Nzuri's shake offers over 26 grams of whey protein to help feed your hungry hair from the inside out. just that. Nzuri is a Swahili word that means both Beautiful and Very Good. Nzuri has created two phenomenal products that will become a staple in your beauty regimen. One thing we know for sure is that if you give the nzuri liquid hair vitamins and the nzuri vida 10 in 1 Beauty Restoration Tonic a fair chance you will love your results. Do you want longer hair, stronger hair, shinier hair? Do you want flawless ageless skin? Nzuri offers all of that. Do you want hair products that are made with you in mind? These products were not just created by some man who just had a good idea. They were created by a woman who knows the ins and outs of formulating high quality products that work. Question. What are the tasty, liquid products that everyone is raving about that is making their hair grow? body where you hair can grow up to 150 to 200% faster. Question. 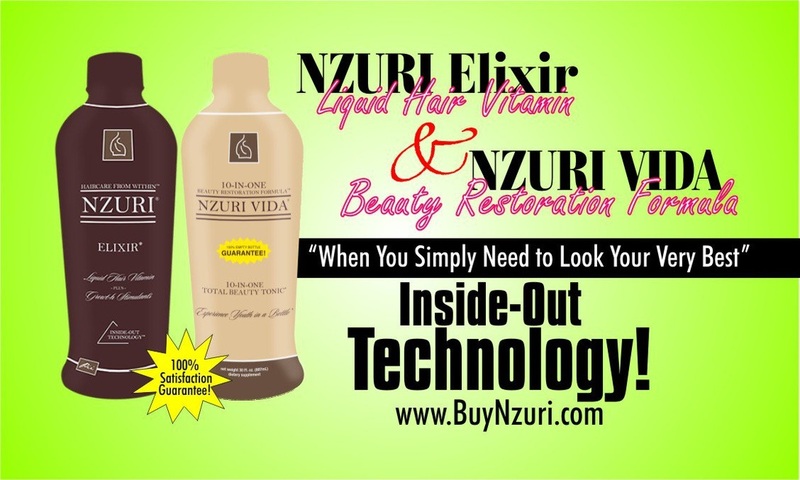 What is in Nzuri Vida 10 in 1 Beauty Restoration Tonic that Helps the Hair Grow? Answer. There are a combination of vitamins that makes it work so well. Below is a list of what each vitamin does for the hair. Most importantly Nzuri Vida 10 in 1 Beauty Restoration Tonic helps to reduce stress. Stress is the biggest cause of hair fallout. If you can reduce your stress, you can minimize hair loss. It also Detox’s the body as well as give you the energy boost your body needs. Question. Do we have to take both products together? Answer. No you do not have to take both products together but we recommend that you do because they work so well together. Although both of them contain some of the same ingredients, each of them has very different capabilities that will maximize your hair growth journey. Question. What is the main purpose of Nzuri Vida 10 in 1 Beauty Restoration Tonic? Answer. Nzuri Vida 10 in 1 Beauty Restoration Tonic is a tremendous part of any wellness program but it has properties in it that can greatly reduce stress. Stress is a leading cause of hair fall. When you drink Nzuri Vida 10 in 1 Beauty Restoration Tonic, you will feel its power usually within 30 minutes. You will notice how well you sleep and the 2nd day we get reports that people feel brand new. Question. My friend used Nzuri Vida 10 in 1 Beauty Restoration Tonic and she lost a lot of weight. Another friend used it and hardly lost any weight. Why such a disparity? Answer. Well, because N.V. has so many ingredients, there are some ingredients that will cause the appetite to suppress. The reason one friend lost more weight than the other is because they obviously consumed a lot more of the product. If you do not want it to suppress your appetite, do not take more than 3 ozs a day. It has been found that 6 ozs a day will cut your appetite and could cause weight loss. Question. What is in Nzuri Vida 10 in 1 Beauty Restoration Tonic that makes it so powerful? Vitamin A - Works to keep the hair follicle lubricated, which adds to the healthy appearance of your hair. Vitamin A is also essential for healthy skin and vision. Beta carotene and Vitamin A (retinol) go hand in hand as beta carotene is converted into vitamin A in humans and other mammals. Both beta carotene and vitamin A are crucial in protecting cell membranes and stimulating bone growth. This cell membrane protection is what makes beta carotene and vitamin A beneficial to maintaining the healthy hair inside and outside of the hair follicle. Vitamin C - It is a known fact that as an anti-oxidant it is a natural detoxifyer that helps to get rid of the toxins found in the skin and organs resulting from the unhealthy foods we eat and the polluted air we breathe. It also helps promote proper blood circulation to the skin and scalp allowing hair follicles to get the nutrients they need to grow healthy hair. In addition, it helps maintain healthy blood capillaries that carry the nutrients to the hair follicles. According to Merck Pharmaceuticals, vitamin C (ascorbic acid) is crucial in the formation of, growth of, and repair of bone and connective tissue which includes blood vessels and skin. The scalp holds the hair follicle and the blood vessels that carry nourishment to the hair. The scalp also secretes sebum or oil to moisturize the hair. Vitamin C helps to nourish the hair follicle so hair can grow properly and keeps the scalp healthy so it can produce enough sebum to keep the hair moisturized and prevent it from breaking. *A deficiency in vitamin C can result in dry, brittle hair. How this relates to hair is linked to the scalp which is made of skin and a multitude of blood vessels. Vitamin E Vitamin E is an antioxidant that stimulates the scalp by increasing blood circulation. An increase in blood circulation makes more nutrients available to the hair follicles so they can grow stronger, healthier hair. It is also believed to enhance the immune system, which can also help prevent hair loss. *Women who are trying to become pregnant should avoid taking supplemental vitamin E as it has been proven that it can contribute to congenital heart defects in the fetus when taken during the time of fertilization. Vitamin B1 (thiamin) It is essential for healthy growth of hair, skin, muscles, brain and nervous system. Is useful in times of stress and have also been used to treat fatigue, irritability, and depression, One of the major roles it plays is helping the body convert carbohydrates and fat into energy. It is also essential for normal growth and development, and helps to maintain proper functioning of the heart and the nervous and digestive systems. Vitamin B2 (riboflavin) A water-soluble vitamin that supports energy metabolism. It is vital for normal reproduction, growth, repair and development of body tissues including the skin, hair, nails, connective tissue and immune system. Prevents dandruff and helps with the absorption of iron. Vitamin B3 (niacin) Promotes healthy blood circulation to the scalp--this carries other vitamins, minerals and nutrients needed for healthy hair. It’s mainly influential in alleviating stress, a principal cause of many hair problems. Biotin Thickens the hair strand. Essential for preventing hair loss and may help prevent your hair from turning gray prematurely. Some experts believe that biotin prevents the hair from going grey and also that it could prevent hair loss. Question. I notice that my friend who has been on the Nzuri Vida 10 in 1 Beauty Restoration Tonic also has a very healthy glowing complexion. What is in the product that makes her look so good as well? Answer. It has Acai, Cupucua and Yerba Mate. That is a combination of Super Foods that make Nzuri Vida 10 in 1 Beauty Restoration Tonic unlike any other health beverage on earth. The anti-aging components are not in just one but all three of the superfoods. So, not only will you see a benefit in your hair, your entire body will greatly benefit from this power house beverage. Zinc Zinc stimulates hair growth by enhancing immune function. that this vitamin helps to reduce the plaque on the arteries, and further enhances the absorption of Vitamin E.
To order Liquid Hair Nutrition, please click here to contact us.